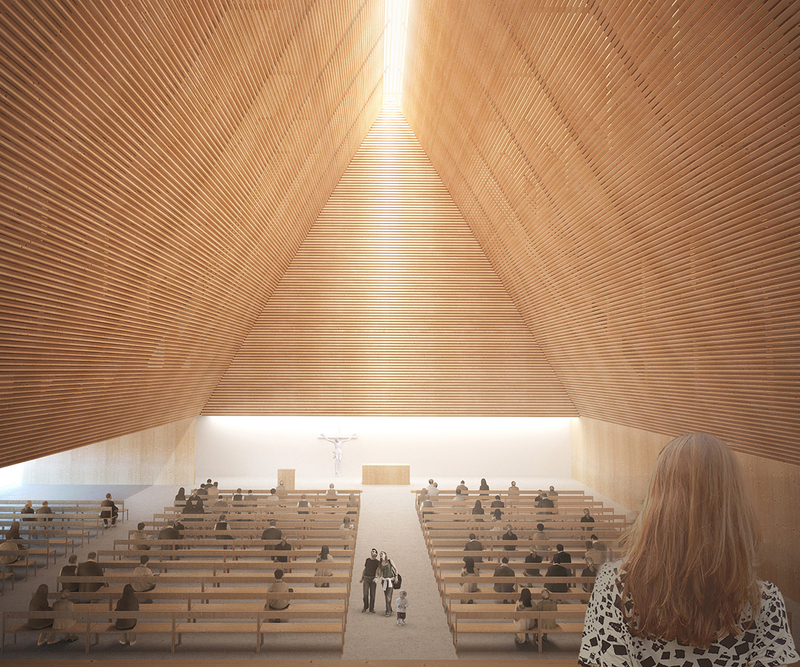 The architecture competition for the new Ylivieska Church was organized by the Ylivieska parish and it was open to participants in Finland and the rest of the European Union. The assignment was to design a new church to be built after the old wooden church from 1786 was lost in a fire in 2016. 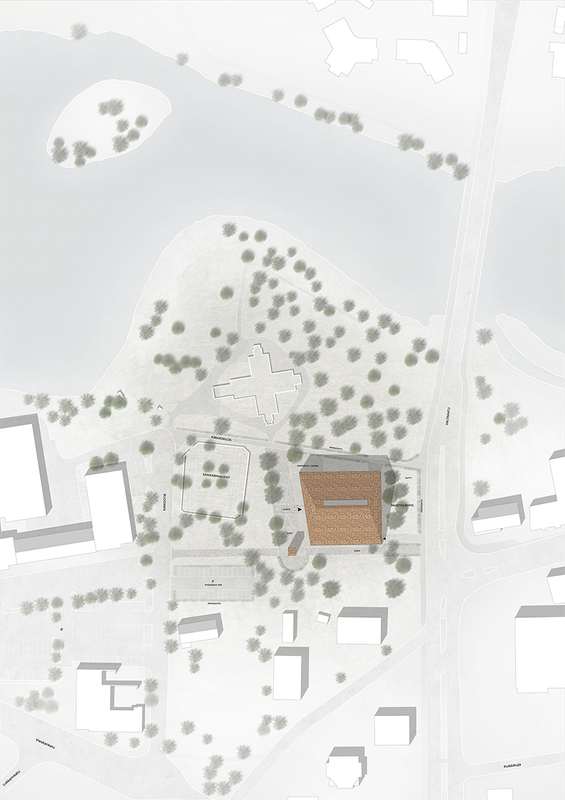 The competition site is located in the center of the town of Ylivieska in a landscape of cultural and historical value by the Kalajoki river. Out of a total of 214 entries OOPEAA’s entry ‘Kooda’ received a shared third place in the competition. Seven entries were nominated for prizes: in addition to one winning entry, two entries received a shared third place and four received honorary mentions. No second prize was awarded. Kooda was judged by the jury to manifest a high level of professional quality with its simple and strong church building with a saddle roof and a tall, sharp and slender belfry standing on pillars. The assignment was to create a functional concept of high architectural quality for a church building and a parish hall that works well in harmony with the surrounding landscape and offers potential for further development of the area while also serving as a landmark for the town. 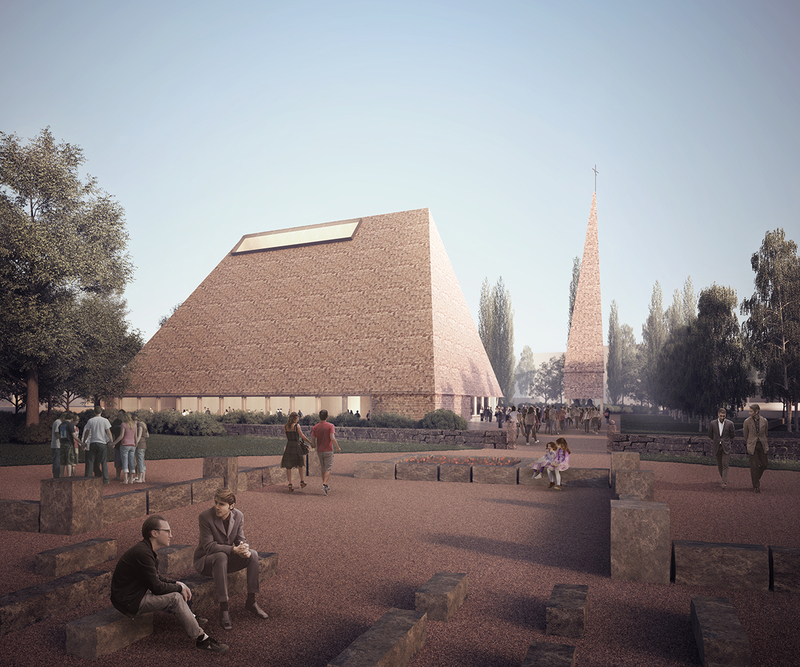 It was asked that the new church resonate with the tradition of Christian church building and that the proposal also address the surrounding landscape with the ruins of the burnt down old church, the graveyard for war heroes and the parkland around the church. The competition assignment also asked to take into consideration the traffic arrangements serving the needs of the visitors as well as maintenance and service needs for the church and the parish. The new church of Ylivieska fucnctions as a link between history and the future. The rich tradition of the Finnish church offers a foundation for the design and serves as a springboard for reaching out towards something new and beautiful. In Kooda, the big loss that the people of Ylivieska have experienced when the old church from the 18th century was lost in fire is turned into an opportunity to make peace with the past. The building takes its place as an identifying landmark for the town in the corner of the main street Valtakatu and the shopping street Kauppakatu. One can approach the church from three directions: from the direction of the Kirkkotie (Church Road), from the direction of the Valtakatu (Main Street) or through the ruins of the old church. Together with the new belfry and the ruins of the old church, the new church forms a unity. Between the old and the new church a square covered with gravel links the church with the surrounding landscape and serves as a meeting place where one can both reminisce the old and rejoice the new. As a whole, the church with its surrounding buildings and the yard affords the parishioners an opportunity for a multiplicity of diverse uses from large outdoor events to quiet contemplation. The building has a strong character that appears soothing and full of meaning. 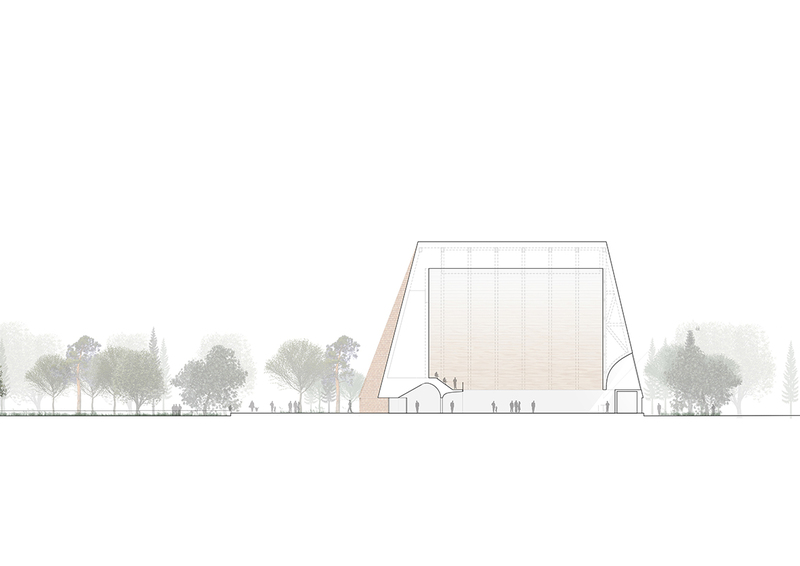 With its pitched roof, the shape of the building makes for a beautiful light coming from high above into the tall interior of the church hall and provides also for a flexibly adaptable and multifunctional parish hall and lobby spaces. The flexibility and multifunctionality of the spaces is a key principle in the design, yet a peaceful sense of sacral space is strongly present in the atmosphere. The new church has a strong presence in the area. The bold and simple massing and the facades sparse in expression give a strong character to the new church with its tall belfry creating a landmark that gives identity to the area. Glass facades that open to the west and south give the new church a sense of lightness creating a dialogue in contrast to bold massing of the body of the building. Long eaves protect the glass facades sheltering them from light and rain. 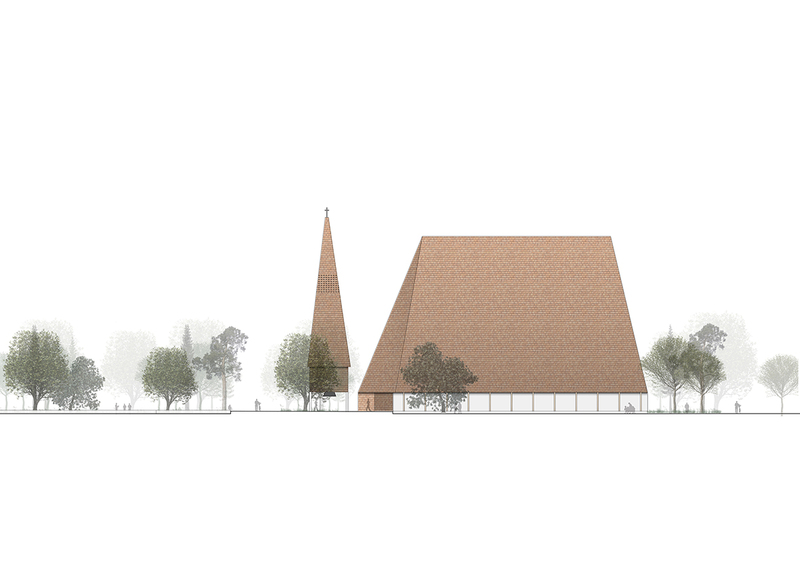 It is proposed that the church and the belfry be clad with untreated shingles of aspen. 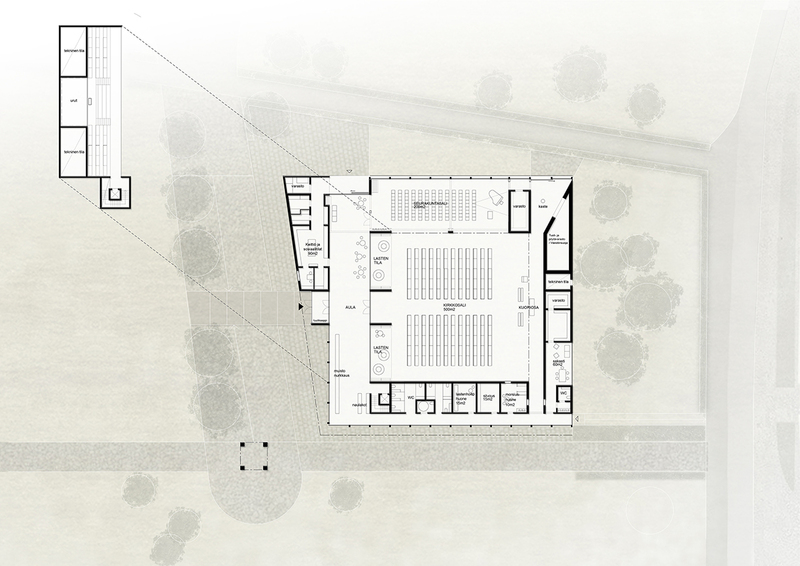 The glass walls of the parish halls open into the old graveyard and the beautiful park bridging the interior spaces with the surrounding landscape and allowing the functions inside to be visible also from the outside. The building is both functional and flexible. Movable walls can be used to create spaces of varying sizes either separating them from the main church hall or opening them into one large space according to need. The church hall itself is multifunctional and it can be arranged to serve a great variety of needs. 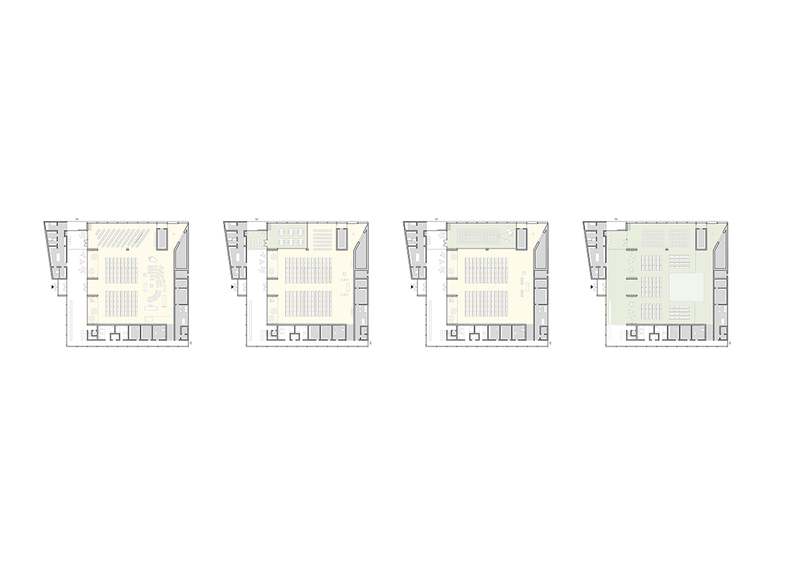 The lobby space may be joined into either the church hall or the parish hall according to need. In the south-western part of the lobby area there is a dedicated memorial space to commemorate the old church and to tell the story of its fate. The altar extends into a side altar that facilitates more intimate services, such as christening ceremonies, and it also leads into the memorial grove to the east of the church. The organ and the choir are placed up on a balcony above the entrance. The arrangement allows for an efficient use of space while also creating an interesting spatial experience.